When I designed the Hillbilly Tansu, I made a concerted effort to make it modular. Even so, it became apparent that glue-ups would be challenging. Lots of joints needed to be seated with each stage of construction. Experience tells me that the ubiquitous yellow wood glue requires speed in these types of glue-ups. If you’ve ever experienced joint “freeze” in the middle of an assembly, you know what I’m talking about. I actually considered going the traditional Japanese route and use rice glue. It’s easy to make but needs to be made before every gluing session. That’s not going to happen in my shop. There is no way I could plan my limited time in the shop to include cooking rice and mashing it into paste. So a little bit of research and the overwhelming solution seamed to be liquid hide glue. I’ve read about, watched videos but never used hot hide glue. Animal bits soaked and cooked in a double boiler creating, by all accounts distinctive smelling, amber glue. But this stuff sets up quicker than our friend yellow glue. In fact, that is one of the advantages of hot hide glue. It’s highly recommended for operations where you want the parts to stick together as quickly as possible. Panel assemblies and veneer work top this list of applications for hot hide glue. I knew liquid hide glue existed but never gave it much thought. I was generally happy with the yellow glue that I had been using and I wrongly assumed that the liquid version behaved just as the hot version. Not so. Liquid hide glue is, in fact, hot hid glue but with the addition of urea. The added urea causes the glue to remain liquid at room temperature or slightly higher. The other thing that the urea does is retard the set time. Now the setup and cure is determined by evaporation or absorption of the glues water content resulting in a longer working/open time. Inside the joint the wood absorbs the water. Any squeeze out relies on evaporation. This means that any thicker globs of squeeze out could take days to dry. So you will want to address any squeeze out during the assembly. There are two options that are available for purchase on the market. Titbond and Old Brown Glue. Essentially these two are the same. The main differences being that the Titebond version is liquid at room temperature and widely available and Old Brown Glue needs to heated above 140deg to obtain a liquid state and may be more difficult to locate, although this seems to be changing. Strength and open time for the two are almost identical. Popular Woodworking did a side-by-side comparison of the two and detailed the results. You can read that article here. An additional feature of liquid hide glue to note is that it is reversible by applying heat and water. If you make an error during assembly, you have the option of taking it back apart. Years down the road if something is damaged, you can disassemble, make repairs and then glue the assembly back together. Which brings up a disadvantage. High moisture and heat areas are not good locations for items that are assembled with hide glue. Bathrooms, kitchens and anything out-of-doors. The liquid hide glue from both manufacturers has a shelf life. So be sure to check the date on the container before you purchase. 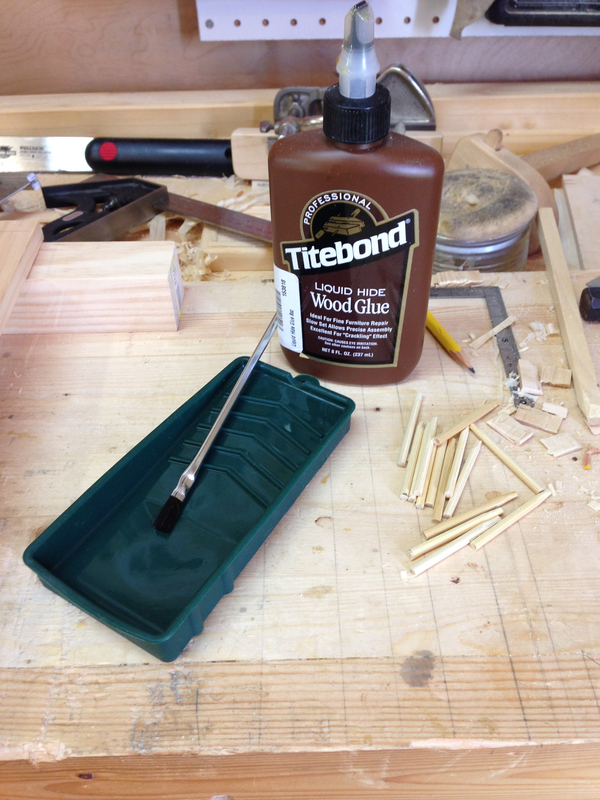 My local Woodcraft carries both brands of liquid hide glue and in the end I chose to go with the Titebond product. I made this decision solely on the fact that it is ready straight out of the bottle at room temperature. I didn’t want the added complication of having to heat the Old Brown Glue before using it. I also picked up a couple other items to make my glue-up go a little smoother. Up to this point I have always used yellow glue straight from the bottle. Squeeze out a dollop on the joint and distribute the glue with a scrap of wood that was roughly shaped for the task. I decided that a little more sophistication was in order and purchased a silicon glue tray and a package of glue brushes. Woodcraft actually sells two different glue trays. One touted for brushes the other for rollers. The one for brushes seemed too deep and the sides too flexible, so I opted for the one designed for glue rollers. Works great. The glue stays in a puddle at the bottom and the brush lies on the ramp. Wet glue washes off easily and dried glue will just peel free from the silicone. The brushes are sold as disposable but, since hide glue will dissolve in water, I just give them a soak and a rinse and they are ready to go again. I wish that I had tried liquid hide glue before now. The extended working time has greatly reduced my stress level during glue-ups. Plus there is the added comfort of knowing that I can take something back apart in the event of a major malfunction. I find it much easier to control the application of liquid hide glue as opposed to yellow glue. The liquid hide glue has a thicker consistency and stays where I put it. No runs or drips. Clean up is easy as well. I have yet to experience any joint freeze while using the liquid hid glue. Even on my most time-consuming assembly that ran at least 30 minutes. In fact, I feel that the liquid hide glue adds a measure of lubrication. Joints go together easier than when they were dry and gentle clamp pressure is all that is needed to fully seat them. Will liquid hide glue completely replace yellow glue in my shop? Probably not, but yellow glue will see limited use from now on. I’m completely satisfied with the Titebod liquid hide glue, but may give the Old Brown Glue version a try when I need to replenish my supplies. If for no other reason than to support a small American company. This entry was posted in Hide Glue, Thoughts-Views and tagged Hide Glue, liquid hide glue. Bookmark the permalink. Thanks for the review, will definitely look into it as my frustrations with regular yellow/Gorilla glue has been leaning me away from all glues and relying on compression joints only. Hide glue seems to be a nice compromise. Your most welcome. I find that liquid hide glue works particularly well with compression joints. You can pre-compress the male portion of a joint by tapping it with a mallet. This makes assembly much easier. Once assembled, the joint absorbs the water from the glue and swells in its socket/ mortise. It works great. I did a test by using water only. The joint went together easily with hand pressure. 30 seconds later I couldn’t pull the joint apart. Thanks for the review, I picked up a bottle of the titebond a while back and have been meaning to give it a try. Could have used it on my Paul Sellers Bench project, my first attempt on the top did not make me happy. At least 2x stock is cheap, hide glue is cheaper. Flattening the workbench top is great practice. Sometimes its more practice than we want. 😉 We all have obsessed over our bench tops. The first scar hurts, after that the obsession subsides. Mine has been sawed into, chiseled into and I regularly drive screws into it to secure a batten. Flat and solid is all that matters once its put to work. I am of the same mind, entirely. I love that it is reversible, and I love how easy it is to work with. I can’t remember the last time I used yellow glue when I had hide glue available. Thanks for the note Brian. My experience is limited to just this one project. Are there any issues that you have run into using hide glue? You can get OBG from Lee Valley. Steven Shepard (full chisel blog) wrote a book on Hide glue that is very informative. He expains how to make hide glue waterproof and how to glue disimaliar materials. Worth reading if you’ll be using hide glue as your go to stuff. It’s funny you should mention Steven Shepherd’s book. I’ve been searching for a copy, it seems to be out of print, and finally found an affordable one last night on AbeBooks. It’s been ordered and I’m looking forward to reading through it. Old Brown is getting easier to find. Tools for Working Wood, Lee Valley and now Woodcraft. I’ll be giving a try for sure the next time I buy glue. I still didn’t tried because importing from the US (OBG) makes it very expensive. And the Tidebond HG is very rare in local suppliers. But… “grude” – the old fashion hot animal glue (rabbit, fish and other glues with different strengthen) are very cheap around here… I saw myself considered changing from wood white glue a few times. No, I hadn’t read the blog entry about the veneer hammer build. Very Interesting and thanks for the link. The Popular Woodworking article, that I linked to above, has directions for making your own. So you could go that route. Greg when you say cleanup is easy, how about on the workpiece itself? You mention having to clean up squeeze out, but does it leave a tell tale sign like yellow glue on the piece when finish is applied? Just curious as to your experience.. You’ve got me thinking. A warm, damp cloth will clean any residue from the work piece. I’ve only used hide glue on this one project though. The tinted wax I’m using would not penetrate the wood if their were any glue residue left on the piece. End grain is the area you have to pay special attention to. The end grain wants to soak the glue up. So make sure to wipe any squeeze out off the end grain as soon as possible. Remember, this glue will dissolve with heat and moisture. So all residue should be removable. Very informative, don’t think I’ve ever seen the topic addressed so fully. TVMI Gregg. Fwiw, one of the teachers at my local woodcraft, one who studied with Tag Frid, says plain ol’ Elmer’s white glue has a 30 minute open time, and will work for most applications. So far, it’s working pretty well for me. Thanks for that Jason. I had seen on a few forums people touting Elmer’s Glue All as what they use for extended open times but haven’t been able to find any articles on its strength. Good to know that its working for you and is a viable option. This could be especially helpful for those who don’t have access to liquid hide glue. Thanks again for the information.